Hello! How is your day going? I feel like it’s been a little while since I’ve talked to you. It’s not because I’ve been really busy. It’s because I got some type of stupid stomach bug last Sunday night. And it lasted almost a whole week. And one thing I discovered about being sick–it’s really hard to get better when you have a toddler at home. The only time I got to rest and take a nap was when he took a nap–one 2 hour nap a day. I have learned to really cherish naps–and Ginger Ale. That’s a miracle drink! However, I felt much better this weekend and made a Chocolate Apple Bar recipe Saturday, but it was just okay. And I don’t want to put just okay recipes on the blog. So today I made something different. 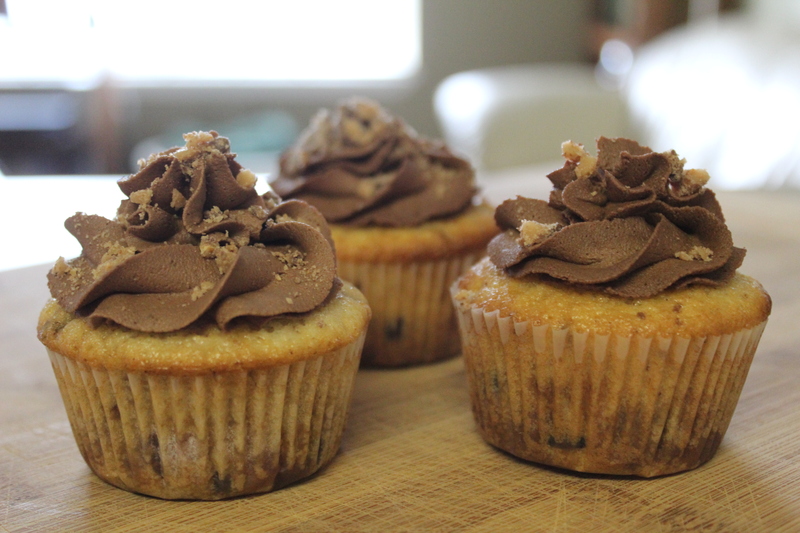 Cupcakes with chocolate chips and toffee bits. 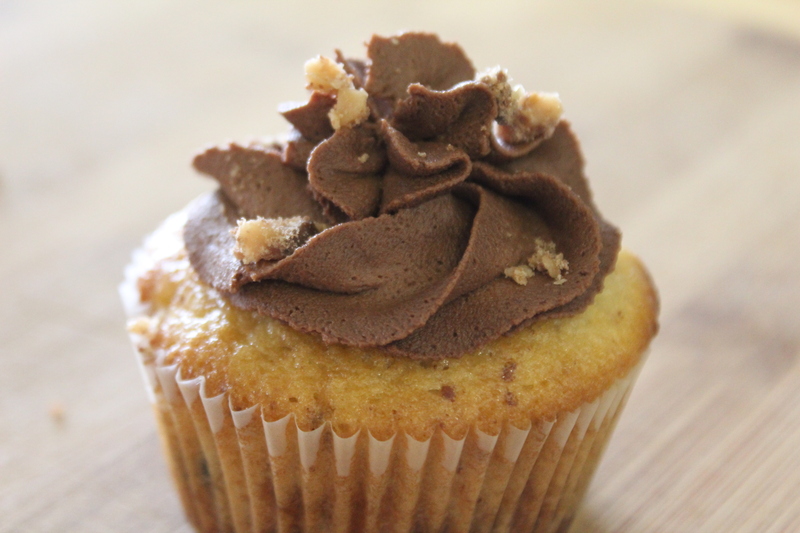 And since there’s a little hint of peanut butter, I decided to make a fudge peanut butter frosting. Yum! Pre-heat oven to 350 degrees. Line a muffin tin with cupcake liners. Using a mixing bowl with a paddle attachment, pour baking powder, both flours, sugar, and salt into the bowl and mix on low speed for 2-3 minutes, until well combined. Add the cubed softened butter, and mix on low speed until the butter is well-coated and pieces are small and crumb-like, about 20-30 seconds. Add eggs, one at a time, until combined. (The egg yolk is dissolved.) Slowly add the milk and vanilla—scrape down the bowl to get all ingredients combined. Fold in the chips and 1 cup toffee bits. Fill cupcake liners about 2/3 full, and bake 17-20 minutes, or until tops are golden brown and toothpick inserted into the center of the cupcakes comes out clean. 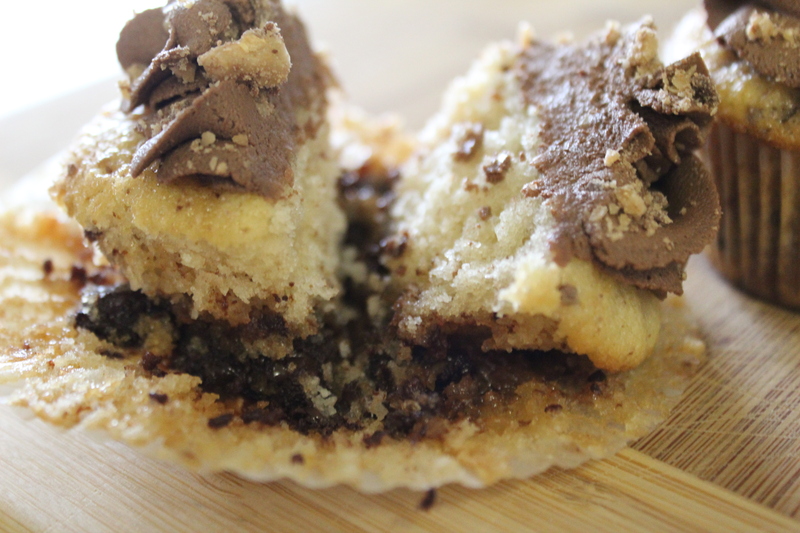 Take cupcakes out of muffin tin and transfer to a cooling rack. Cool before frosting. Beat butter, peanut butter, and salt until creamy. Add powdered sugar, ½ cup at a time. Add cocoa powder and beat until smooth. Slowly add the milk and beat until smooth and creamy. (Add more milk if you want it thinner. If you’ve added too much milk, add a little powdered sugar.) Pipe or spread frosting onto cooled cupcakes. 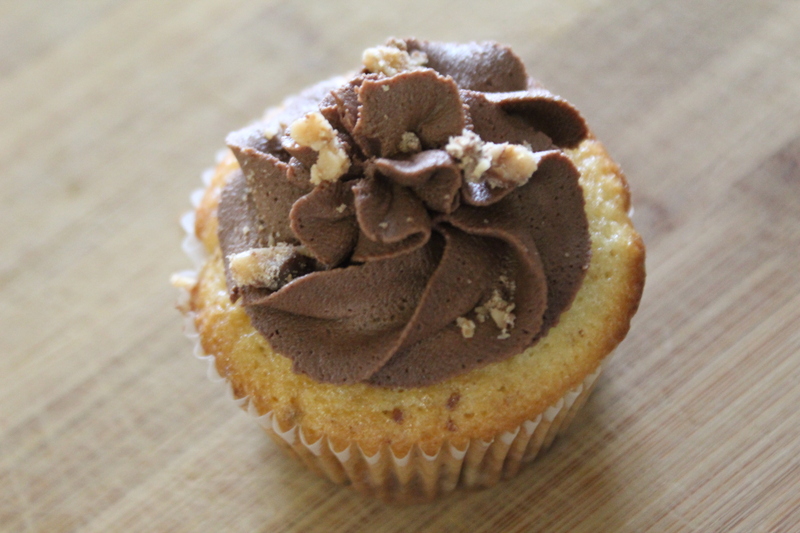 Sprinkle remaining toffee bits on top of cupcakes.